Everyone breathe a sigh a relief! Our pandas have won a temporary extension to stay at the National Zoo. Mei Xiang and Tian Tian are on a 10-year, $10 million loan from China that expires at the end of 2010. The Smithsonian's National Zoo continues to negotiate a new agreement for panda breeding and research. Zoo spokeswoman Karin Korpowski-Gallo said Wednesday that China has granted a temporary extension for Mei Xiang and Tian Tian to remain until a new agreement is signed. Officials expect an agreement in January. 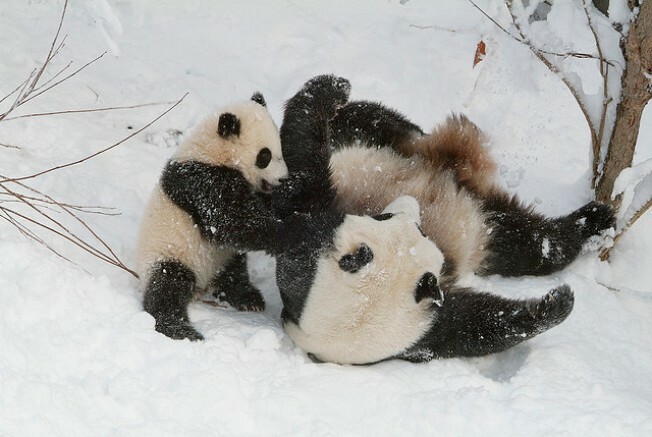 Pandas have a long history in the District. The first panda couple, Ling-Ling and Hsing-Hsing, arrived in 1972 and lived more than 20 years at the zoo after President Richard Nixon's historic visit to China. And we probably don't need to remind you of that beloved butterstick Tai Shan, who moved to his homeland of China earlier this year.